The "Bring Tohoku Kids to Swiss Camps!" Project was founded in 2013 to invite children affected by the Great East Japan Earthquake and Tsunami to camps in Switzerland. We hope that the children experience the international friendship while enjoying activities and language study with children from various countries in Switzerland. The second project will take place in Arosa. A 11-year-old girl from Ishinomaki will participate in a two-week summer camp. 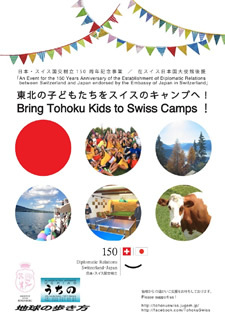 - Homepage "Bring Tohoku Kids to Swiss Camps!" - Facebook "Bring Tohoku Kids to Swiss Camps!"